Heriot’s player/coach Peter Ross returns to the team to keep wicket as the Goldenacre men go into the final weekend of the CSL Eastern Premiership season with a chance of winning the title. They are at home to Aberdeenshire tomorrow, the side that put Mazars Grange out of the race eight days ago, while across town at Grange Loan leaders Arbroath are at newly-crowned Citylets Scottish Cup champions Carlton. If Arbroath are victorious then the trophy heads to Lochlands, but if they lose then Heriot’s can leapfrog them with a victory. It promises to be an afternoon of high drama with players and supporters eager to find out what is going on at the other ground. But Heriot’s skipper Keith Morton wants his charges to only focus on their match and what they can control. “We are really looking forward to this match and, obviously, we just have to put in the best performance that we can,” he said. “Aberdeenshire have shown on their day that they can compete with anyone this season, and last week they defeated Grange so we know it will not be an easy afternoon. Ross missed last weekend’s victory against SMRH because he was coaching the Scotland Women’s team, but he returns in place of Michael Evans and will be back behind the stumps as usual. Key men for Heriot’s this term have been Mark Watt (468 league runs and 30 wickets), Hayes van der Berg (446 league runs) and Ryan Brown (25 wickets) and they will again have a big part to play. Across town at Carlton, Arbroath are likely to take a big crowd of supporters to Grange Loan as they look to win the title for the first time since 2013. The home side, who won the league last term, will be without Fraser Watts who is on holiday, but Australian Michael Herdman (632 league runs) will be keen to finish top scorer in the division for the summer. 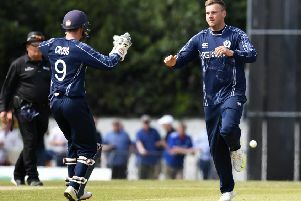 Carlton skipper Ali Evans said: “The young players who have come into the team this summer deserve special praise and they now have one last chance to go out at Grange Loan and show what they can do. Third placed Grange are away to fifth placed Glenrothes, fourth placed Watsonians build-up for Sunday’s national T20 finals day with a home clash with already relegated Falkland and SMRH are at Forthill to play Tayside Group Forfarshire. In the Baillie Gifford ESCA Championship the title race is also going to the wire. A win for RH Corstorphine at Dunnikier will ensure they finish top and enter a play-off for a top-flight spot in 2018. However, if they lose then second placed Edinburgh could still finish above them with a home win over Carlton II. Leaders RH Corstorphine bring in Oscar Dimdore-Miles, Louis Cox and Richard McCorkell for Gordon Lamb, Robert Thompson and Ozzie Malik. Their skipper Joe Kinghorn-Gray said: “We are really looking forward to the Dunnikier match and are just treating it like any other fixture. “We are certainly not getting ahead of ourselves because we know that Dunnikier are a good side and they have some good players.